Michael Jordan is one of the most iconic athletes of our generation. 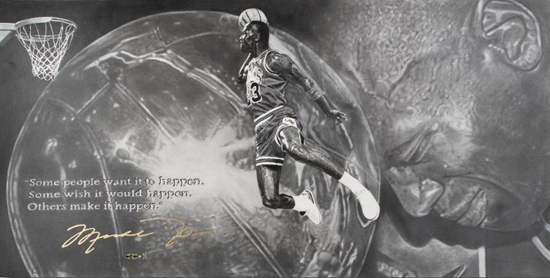 With so many different memorabilia items of Jordan in the market, Upper Deck Authenticated partnered with artist Robb Scott to bring something truly different to the market. And the artist came up as clutch as MJ with the ball on a final possession. 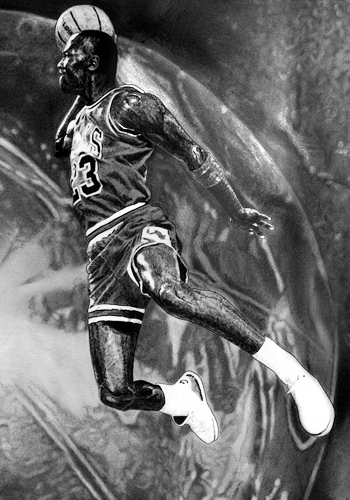 Scott's prints were signed by Michael Jordan and are limited to just 72 copies. “I’ve always loved Michael Jordan. I loved everything about the way he played and approached the game. His talent, his drive, his passion and his will to win. Those things always stuck with me about his personality. When the opportunity to work with him presented itself, I knew immediately I wanted to try and capture those qualities. There is an incredibly amount of detail to the piece and it is amazing to think that this was all done in pencil. Robb worked on this incredibly detailed drawing over a two month span spending approximately 120 hours on it. The piece was created in pencil on 140 pound professional art paper. These prints are all sold through Robb Scott and are available through his website at www.RobbScottDrawings.com. They were recently signed by Jordan during an Upper Deck Authenticated signing session and are currently available for purchase. This is a limited-edition print of 72 in honor of the Chicago Bulls record setting 72-10 season. The prints retail for $1,950 and the original is $17,500. 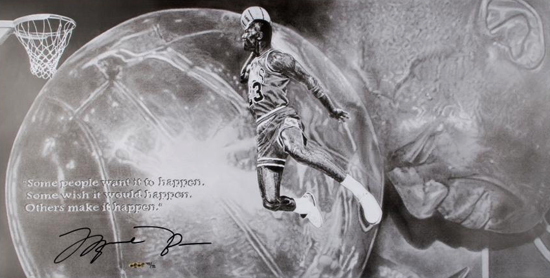 The original is also available limited as a 1/1 collectible, signed by Jordan in a paint pen. It is a very impressive work of art, from one of the most impressive athletes of our time. For more on Robb Scott, “Like” him on Facebook. One great artist and one great artist on the basketball court.